You'll visit kid-friendly attractions like Kankaria Lake and Akshardham. Explore the numerous day-trip ideas around Ahmedabad: Thol (in Mehsana) and Adalaj Trimandir (in Gandhinagar). And it doesn't end there: enjoy some diversion at City Pulse Multiplex, test your team's savvy at popular escape rooms, contemplate in the serene atmosphere at Dada Bhagwan Temple, and contemplate the long history of Sabarmati Ashram / Mahatma Gandhi's Home. To see where to stay, reviews, maps, and more tourist information, you can read our Ahmedabad route planner. Mumbai to Ahmedabad is an approximately 3-hour flight. You can also do a combination of flight and train; or drive. Traveling from Mumbai in May, expect nights in Ahmedabad to be about the same, around 32°C, while days are a bit warmer, around 50°C. Finish your sightseeing early on the 20th (Mon) so you can travel to Bangkok. Bring the kids along to SEA LIFE Bangkok Ocean World and Safari World. 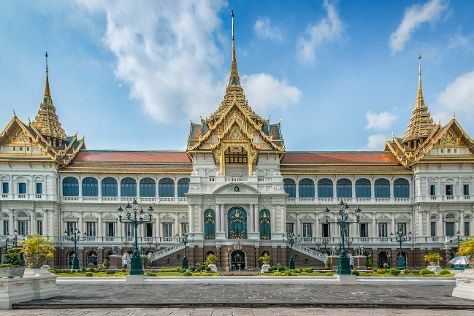 And it doesn't end there: step into the grandiose world of The Grand Palace, buy something for everyone on your list at Siam Paragon, get a taste of the local shopping with Chatuchak Weekend Market, and take in the spiritual surroundings of Wat Saket. To see maps, where to stay, reviews, and tourist information, go to the Bangkok day trip planning site . Fly from Ahmedabad to Bangkok in 5 hours. Alternatively, you can drive. The time zone difference when traveling from Ahmedabad to Bangkok is 1 hour. Traveling from Ahmedabad in May, you will find days in Bangkok are slightly colder (41°C), and nights are about the same (32°C). Finish up your sightseeing early on the 24th (Fri) so you can travel back home.